Theme - Big tower shields, heavy armor, Think a roman legion made out of stone soldiers. Description - The stone warriors lived in the center of the world deep underground, when the cataclysm came, Their underground cities came into contact with the rest of the world, quickling bringing their attention to defending their dark mines. Playstyle - The units are tanky but with very few attack, instead they have strong abilities that work together with each others, Using the offensive power of their opponent as a trap. Aleta - Aleta, Immortal jeweler. once a turn, create a 0/1 gem puppet, that puppet is permanently exhausted and count as a 1 resource character. pay 4. Deal 1 damages to each of target player's characters, that player gain 2 life for each character that dies. Name - Darkname, the forgotten ore.
Ability - once a turn, during the ability resolution phase. Characters in the opposing zone ( player's support vs enemy's support, player's attack vs opposing's defense, ect.) lose one health and gain 1 attack. Picture - A stone giant in heavy black and gold trimmed armor, you can see unknown metals spikes extruding out of his body, with magical energy flowing from them. Flavortext - A single glance of the strange metals extruding from his body make any living thing mad with rage. Description - Filled with beggars, gentlemen and ladies. However, nothing in world is what it seems. The blood of every person in this world is cursed, There is no such thing as a true human anymore. They might seem like normal people to everyone, but that is only before their instincts kicks in, transforming them into monsters. Playstyle - The characters have abilities that activates through different triggers, transforming them into creatures. Ability - If Aleta is in the graveyard for 6 consecutive turns, she returns to play. Exhaust, Aleta loses 2 HP: target 1 transformed character in your graveyard, add it to your hand in it's original state. Picture - Aleta giving a creature a drop of her own blood, making it turn back into a human. Flavortext - The last true human in the world. Her pure blood can turn any creature back into a human, atleast until it becomes cursed again. Ability - If you control another Passerby in the same zone as this, it becomes Untouchable. Pay 2, transform this character into a 3/5 beast character. Picture - People walking pass eachother on a street, which of those people this character is, is unknown. Flavortext - "The best camouflage is to just look like any other guy." -John the thief, murderer, kidnapper and regular guy. Ability - When 3 or more characters you control dies in one turn, Soulmilk transforms into a 7/7 Unstoppable demon then place it into your attacking zone, it cannot be moved from this zone. Picture - A thin, tall man with long hair, wearing gothic clothing and a top hat while drinking tea. Flavortext - "No one have ever seen him lose his cool twice, mainly because no one survived during seeing it their first time." Theme - Ghost themed with a similar hierarchy to the dread in the Riftwar saga. Description - Inhabitants of the void between all realities the Wraiths are a race that travels from reality to reality sucking the life from the realm to feed their masters. After a realm is destroyed it fades and becomes part of the void. The void is a mass of greyness that holds the universe together the dread are its inhabitants and they are the only ones capable of navigating it without aid. because the wraiths are one with the void without its presence they grow weak and eventually after prolonged separation from the void a wraith will die. How the wraiths came to be is unknown along with a lot of other things about them however what is known is that they are unstoppable once they create a void portal. A void portal is a tear in reality it is were the fabric of reality is warped into the void. No living creature has gone near it and survived and the Wraiths grow stronger in its presence. 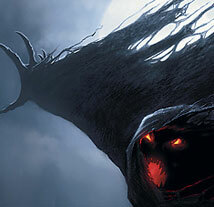 The Wraiths are ruled bu the Mighty Wraith-King who sits upon his throne and its the fattest of all the Wraiths. Next are the Wraith-Lords They command one of the 7 sectors of the void with each one covering thousands of realties. After that are the Wraith-Masters these are to most senior wraiths we have encountered they are the grand marshals of their Wraith-Lords' army. Wraith-Knights are the special soldiers of the dread they are experts at everything and tend to form the advance party that establishes an area for the void portal. The most common of all these are the Wraithlings they are the grunt of the army weak and small they are seemingly limitless and while weak alone are dangerous in a horde. This is based of the Dread in the Riftwar Saga "Go read it now!" Theme - A sect of lethal ninjas that deploy missions on land and plunder on the high seas. Description - Whether it is stealth assassination on land or underwater ships (kinda like submarines) striking and boarding ships on the sea for plunder, the SoT gets what it wants and the targets don't see what they'll get till it's too late. Lethal assassins that raid everything land or sea. Members of the Society wear dark blue and black tones to blend in with the night and the sea. Playstyle - Shifty characters that either hide, ambush, or infiltrate their foes to accomplish their task. Ability - Stealth, You cannot target this card with other cards or abilities. Pay 3: This character deals damage equal to its' power to a character in a combat zone. Pay 3: This character gains Infiltration (This character cannot be blocked except by characters with Stealth). Whenever this character kills a character or deals damage to a fortress, this character gains +2/+2 and Stealth. Theme-starts very week early, but combining characters creates much stronger characters, very dependent on keeping starting character to be able to be able to combine to the stronger characters. Also that each character you have is a part of an even stronger character. Description- After the world was shattered, life deteriorated into smaller forms, only to resemble and evolve into beings stronger then ever imaginable. Playstyle- Very passive at the start, holding onto early units to use them as building blocks for creatures that scale rapidly. Control is devastating as it works as a reset for acceleration, but if it is avoided there is high reward for reaching stronger characters. Characters are sacrificed to form other character so the character count is kept low. Two types of "traits" would attached to certain characters allowing them to be spend on a character that require a certain amount of the two types to be played, the types would be something along the line of basics and links, and characters with that "trait" would be used as a cost for progression, as well as the new characters retaining that trait. Also to keep the ball rolling for this faction, whenever a character is combined for so another character, draw a card at the end of the turn. If Aleta is in the graveyard for 6 consecutive turns, she returns to play. while Aleta is in play, the cost of playing a character requiring links and basics would be reduced by one. This cannot reduce the cost below zero, and when ever a cost is reduced from this effect, Aleta loses one life, and for every 3 times she loses life to this effect, she gains one life back. this effect does not stack. unlimited- slime, 0/3, cost 1 ability, cannot be moved to a combat zone. Has one basic. ability- untouchable, unstoppable flying. At the end of a turn, each character, excluding Person, the world breaker, takes 6 damage, characters you own take 2 less damage from this effect. He is healed for the life of every character killed by this effect, while stealing their damage. picture- A distant silhouette of a person, amidst a thunder storm, with volcanic eruptions in the background, as well as the ground rippling (massive waves) from the silhouette. Flavortext- Life finally has reached its boundaries of power. Upon the formation of such a being, the very fabric of the world could no longer sustain itself, and thus the end begins. Whenever you cast a spell, gain 1 life and 1 morale. At the beginning of each turn, pay 1 or sacrifice Leeching Magician. If Timeless Mercenary was exhausted last turn, pay 5 or sacrifice it. Theme - A reality where the average did not survive the calamity, only the two extremes are left: the strongest, largest creatures - and those that could hide from them. Description - A mostly nature based deck. Unlike Warpath humanity did survive but was reduced to scattered clans and loners instead of large civilizations. Playstyle - The deck plays like many familiar 'resource pump' decks in other TCGs. The small creatures are either short-term utility, resources pumpers, chump blockers or simple average creatures that give no benefit. Huge monstrosities with Unstoppable and/or Invincible and/or Untouchable and/or able to block flying and/or immolation (Dragon Of Summer Flame style) and so on...These cost a huge amount of resources to play, the least of which cost 10. The abilities this faction controls are either creature pump (add +2/+2 and unstoppable) or creature protection (untouchable buff and such). -Flavor text: Ever since the calamity Aleta decided she ought to gather resources and information and store them in preparation for the next inevitable destruction. For all there is must cease - except her. Unlimited - Carrion Crow: Cost - 2, Attack/HP - 1/1, flying (this faction has no other flying creatures to balance this fact) -- Ability: whenever another creature you control dies, you gain 1 extra resource for the next turn only (this effect does not stack, creature death can only be used once, Carrion Crow can only grant 1 bonus resource per turn). Picture - A young man leaning on a tree from which the leaves are falling (animated fall). Flavor text - "Wherever I go, all I see is the end of things, and beyond that end - a new beginning"
You are probably not going to end up quoting me in your sig. No one else has. 'eh, this stuff is sometimes kinda funish. With that said, I'm doing this in 5 minutes with an idea off the top of my head, so don't expect... I believe the formal term is "quality"
Theme - Delayed and Abnormal Movement. Description - Cities were destroyed, so people began to flee. Rapidly reached the point where more people were fleeing then there was room anywhere, so they never really stopped. If Aleta is in the graveyard for 1 consecutive turn, she returns to HQ (If HQ is full, this effect will be delayed). 2 [resource]: Move target unit you control on the battlefield into another zone. This effect activates after all other spells and abilities, and can only be used twice per turn. If that creature was moved from the support zone, it does not attack or block this turn. Whenever Outrider enters the board, moves, or is moved into another zone, generate 1 [resource] (Resource generation is immediate). 3 [Resource]: Until end of turn, a creature that attacks or blocks outrider is immediately moved to the Support zone. Yourself as a character - ...nah. I'll just provide an example card. Whenever [this] finishes attacking or blocking, immediately move it into the other combat zone. Flavortext - The First was driven to protect and ensure the safety of all. His death left some mourning, but most filled with contempt for his incompetence. Description - In the world of Caroon, mostly populated by things that want to see the humans dead, the settlements across the planet have perfected the art of working together to assure their survival. As the rifts opened they saw a chance to go somewhere else and start a new life. And they knew that when they stood together nothing would be able to stop them. Playstyle - Mass synergy, 'nuff said. Ability - Aleta 6 turn self res. When you cast a Caroon Conglomerate card, you may have target character you control get +2/+2. Picture - Blonde Aleta, commanding a few human running around. Flavortext - "When the world wants you dead, someone has to unite the survivors." Ability - This character gains +2/+0 for each Legionnaire of Order in the assault zone and +0/+2 for each Legionnaire of Order. Picture - A soldier in roman armor with a force-field shield and an energy wrist blade. Flavortext - "The humans of Caroon will live not because of me, but because of our efforts as one." Ability - Pay 3: this character gets +1/+1 for each character you control until end of turn. Picture - A man in golden armor standing atop a hill while soldiers rush the battlefield. Flavortext - "Under my command and the cooperation of the people, the humans of Caroon will prosper." Description - All manners of alien-like creatures , eating the very world itself to sate their hunger which appears to be endless. Their origins are unknown though rumours goes that they come from a large forest , struck by a meteor and since then different creature appeared at that location.....very different creatures.. its only since recently that those creatures moved out of the forest.....well there was a forest which is by now a barren wasteland , their marches leaves nothing more but emptines. Ability - pay 3 , exhaust : send the top 4 cards of your opponents deck to the graveyard. After the combat phase, your opponent sends x amount of cards to their graveyard whereby X is equal to the amount of chippers you control , this effect does not stack with other chippers. Flavortext - A world is shaped within millions of years , let see how fast its gone. Ability - pay 1 , exhaust :Whenever your opponent sends cards from the top of their deck to the graveyard , you opponents sends an additionial 2 cards from the top of their deck to the graveyard. Theme - Creatures that feed off others in order to grow stronger, and in some cases simply to survive, most Leechers gradually deteriorate over time if they do not feed on other beings and can starve, as a result they are prone to turning on one another in order to satisfy their hunger. The main concept of the faction is stealing life and power from other cards, enemies or allies. Description - Parasitic lifeforms that lived in a world of darkness, they thrived by stealing the life force of others but eventually their sources of 'food' began to dwindle and they started to weaken and turn on one another, until rifts opened up in the world providing them with a new source of life and power. Play-style - Basically try to kill all the opponents character cards, these guys aren't going through the army to take the fortress, they're attacking the fortress to lure in the army. Your characters can hit the fortress, but most would lose stats if they do so. They gain strength from combat, regardless of whether they actually kill their opponent, and can become very powerful if they have a large enough supply of cards to feed on or a reasonable amount of 0 attack cards. So basically they're meant to be good against decks that generate and/or play lots of characters, but difficult if opponents are careful and/or play characters sparingly, since your characters either hit the fortress and weaken themselves or kill off each other and lose morale, although the characters typically have low morale costs, seeing as they don't really care that much about each other, they are fine with killing each other after all. New Race/Subtype - Leecher: Leechers are a large group containing a wide range of species, all Leechers have black skin and no eyes, vision and colour being unnecessary in a world with such little light, they sense with smell, sound and/or heat. Most species are closer to animals than humans, however the most 'magic compatible' species is humanoid and intelligent, although they are somewhat insect-like, having fangs and antennae and having claws instead of fingers/toes, this species make up the ragged cloak wearing 'mages' of the faction and are mostly seen in ability card animations as the ones casting the spells. Special Ability - Parasitic X: At the end of the turn if this card has entered combat with another character this turn it gets +2X/+2X, if not it gets -X/-X. You may pay 1 to have the card enter combat with a character you control in the same zone, this ability can only be used once per turn, the card will not attack this turn. Ability - If Aleta is in the graveyard for 5 turns she returns to play. If Aleta dies in combat with an enemy character she is removed from the game and you lose 10 morale. Pay3, Exhaust: Aleta takes 5 damage, each character you control gains +2/+2. Picture - Aleta in a cage, with power being siphoned out and fed through lenses/valves set in the bars of the cage. Flavour text - Ever since the Leechers discovered that her life force could replenish itself she has been kept as a prisoner to act as an infinite power source. Picture - Small black creature, sucking life force from an unconscious person, seems to grow/pulsate with power. Flavour text - They may seem weak now, but give them enough time, and enough victims, and they can become a great threat. At the start of the turn if Shadow does not have a host target a non-artificial non-undead card on the battlefield to act as Shadow's host, that card is exhausted every turn. Shadow cannot attack or block without a host, any damage, debuffs or abilities that would affect Shadow affect the host instead. Shadow's health may not exceed 6. Picture - Guy screaming as he gets coated in black goo, black goo forms into a black, spiky, demonic looking 'suit of armour' with a tail, mouth of armour lets out roar. Flavour text - "Fools! How can you expect to destroy me when you're providing me with so much power?" Picture - Line of exhausted slaves being dragged by chains through a wasteland. Flavour text - These men were once proud and mighty warriors, but their strong life force attracted the Leechers, sealing their fate. Theme - control but with less focus on killing or damaging characters, it focuses more on avoiding combat, discouraging or delaying enemy attacks while hitting the fortress. Description - Civilized beings that live in a world of never-ending light, they are able to survive the harsh light of their world while others would simply burn, they do not like fighting and try to settle disputes while avoiding loss of life. The beings from this faction literally glow, their bodies have absorbed so much light that they constantly emit light. The faction is comprised of tight-knit families with respect for elders, the older they are the more light they have absorbed and the brighter they glow, therefore a persons rank can be defined by how 'bright' they are. They do have the ability to create bright light through magic, they use this to blind and disorient aggressors without causing damage. If someone cannot be reasoned with they will use defensive and deceptive magic, like shields, teleporting and illusions, to avoid combat while targeting the enemy fortress and commanders. Play-style - basically screw with the opponents defense so you can hit the fortress, mess with their attackers as well so they don't hit yours, use mind-games to get your opponent to waste turns and/or resources, but try to avoid losing characters as they typically have high morale cost. Special Ability - Blinded - A blinded card will not attack or block, if forced into combat the card will not deal damage. Ability - Characters that enter combat with Radiant Guardian become Blinded next turn. Picture - Person hits Radiant Guardian's shield, shield flashes, disoriented person stumbles away. Ability - If Mireya the Illusionist is killed or removed from the game remove all Illusions you control from the game. Pay1, Exhaust: Create a 0/1 Illusion character. Picture - Basically a white-haired, very-brightly glowing woman. Ability - Cannot deal damage. If Illusion enters combat or is targeted by an ability it changes to its default appearance and stats. If Illusion would die remove it from the game instead. to it, this ability may only be used once per turn. Picture - A small grey transparent object with its shape fluctuating, like a small cloud of smoke. Ability - When Searing Eliminator hits an opponents fortress the opponents commanders become immolated, taking 2 damage each turn. Picture - Glowing man shines beam of light into building behind enemy lines, building catches fire. Ability - Target non-Effulgent character is Blinded for 2 turns. Picture - Glowing person holds out hand to attackers, card flashes white, attackers stumble over one another.